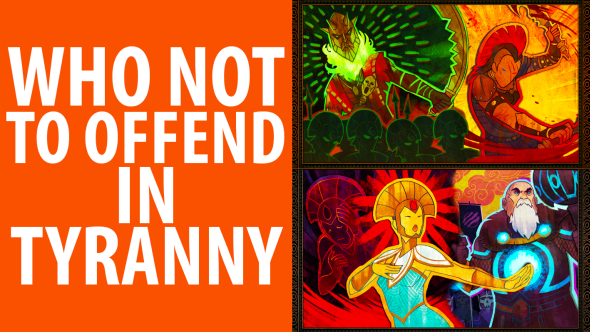 Tyranny is an RPG full of bad people, and most of them are your colleagues. Getting through the nine-to-five without infuriating a man who eats memories or directly disobeying the overlord who rules over Terratus’ conquered lands is easier said than done – so we’ve put together a quick primer on the people you really don’t want to say the wrong thing to once you start your own playthrough. Read more: the best RPGs on PC. The changing events of Tyranny are fueled by a bunch of reputation meters. You can push factions towards wholehearted approval of you, or induce thundering wrath. Companions can be nudged into loving loyalty, or lashed into fear. Of course: fear can be just as useful a means of controlling an individual as respect. Something to remember as you navigate the tricksy politics of the Tiers. Obsidian’s latest is out this Thursday, November 10th. Until then, you can busy yourself with Steve’s dissection of what’s disturbing about Tyranny, or Matt’s look into the way Tyranny builds spells and legends. And you can subscribe to the PCGamesN YouTube channel, where we do lots of this sort of stuff. Hail Kyros!